FDA gave us all a New Year’s present on January 2nd when it announced the Agency’s new Data Dashboard. 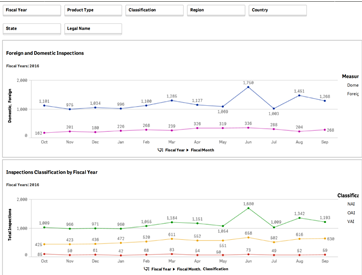 The Dashboard graphically breaks down data on FDA Inspections, Compliance Actions (warning letters, injunctions, and seizures – more commonly known by industry as “enforcement actions”), Recalls, and Imports/Import Refusals, by fiscal year (starting with 2009), product category (drugs, devices, food, cosmetics, etc. ), and in other helpful ways depending on the data set. For example, in addition to filtering by fiscal year and product category, inspection data can also be filtered by the inspection classification (NAI, VAI, or OAI), region (foreign or domestic), country, state, or even company name. Compliance actions can be filtered by the type of action, firm name, region, state, and country. 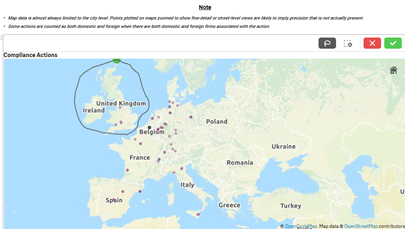 Each Dashboard page features a map that pinpoints the geographic location of subject facilities, and by using the map’s “lasso” function you can select and see data from a custom geographic region. Of course, the Data Dashboard does not provide any information that is not already publicly available through FDA’s website. And it does not offer specifics about the subject of FDA compliance actions, inspectional observations, or import refusals. For these specifics, users may find more detailed information in FDA’s preexisting Inspection Classification Database (updated monthly as of November 2017), Electronic Reading Room – Warning Letters, or ORA FOIA Electronic Reading Room. Importantly, the new Data Dashboard is limited in that “[t]he datasets are updated semi-annually and only include final actions,” and FDA has not indicated when the next semi-annual update will occur. Given that some inspections and compliance actions are not considered “final” for months or even years, the Data Dashboard may not be the best place to look if you are hoping to find companies or products that have been the subject of recent FDA action. However, if you want to quickly identify and analyze longer-term trends, find general information on FDA activities relating to a certain product category, country, geographic region, or a certain company, the Dashboard makes existing FDA data significantly more accessible and useful – a welcome start to the New Year.